This chapter follows contemporary work by introducing what is known as the “social turn” in second language acquisition theory. We argue that older immigrant language socialization is shaped by the social bonding and cooperation present between the novice learner and other interlocutors. 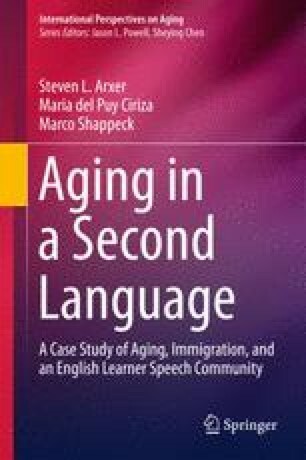 We recognize that functioning in English-dominant spaces may generate cognitive and social challenges for older immigrant language learners and isolate them from positive socialization encounters with English-dominant interlocutors. In this context, age-related beliefs, behaviors, and self-representations emerge from the backdrop of recurrent social interactions. From this perspective, we emphasize that safe places of interaction promote linguistic resocialization for otherwise culturally isolated older immigrants. We argue that research is needed that identifies that practical ways places of language resocialization mediate and reduce these risks and limitations.